[CONT]:Sentinel [AUTO]:Revelation-(GC) (When this unit is placed on the specified circle, look at the top card of your deck, and you may put that card into your soul. If you do, [Rest] one of your [Stand] rear-guards) [AUTO]:[Choose a card from your hand, and discard it] When this unit is placed on (GC) from hand, you may pay the cost. If you do, choose one of your units that is being attacked, and it cannot be hit until end of that battle. [AUTO]:When this unit is retired from (GC), if you have "Goddess of Fort, Kibitsuhime" in your soul, you may Soul Charge (2). The only card with Revelation only useable on Guardian Circle...so effectively free when used, because you hardly ever end your Battle Phase with something NOT rested. Anyway, under certain conditions she also nets free soul, which is pretty nice. 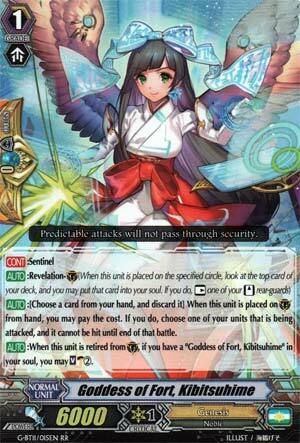 A Genesis deck focused on Ishtar will want this over Hel, but Hel will win out everywhere else due to resource recharge.